This t-shirt shows what looks like the Back To The Future logo but it really says something else but it looks like the famous logo. 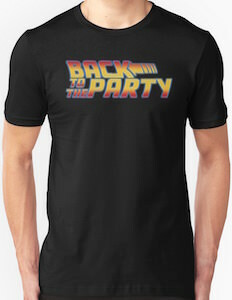 The t-shirt says “Back To The Party” in the same cool look and hey a party should be cool so wearing this t-shirt is perfect. You can get this party shirt in men and women’s styles in many fun colors and in sizes ranging from Small – 3XL. So get the party started and just start it by putting this t-shirt on. And if you want to get a crowed maybe choose to have the logo on the back so that people start following you. And yes you can choose to have the party logo on the front or the back of this fun t-shirt. What better to wear then this t-shirt when the New Year starts. 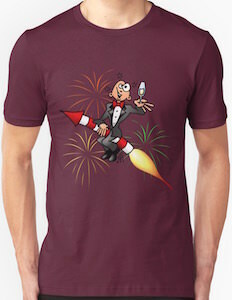 On the shirt you can see a man sitting on a big piece of fireworks and he is bringing a toast as he is holding up a glass of champagne. And yes this t-shirt comes in many fun colors and in styles for both men and women. Sizes range from Small – 3XL and all colors except the heather grey are made from 100% cotton. This t-shirt may not be worn very often but that one day a year you can enjoy this t-shirt for a long time. When playing the classic Nintendo video game Super Mario Bros. you must eat the mushroom to stay alive. 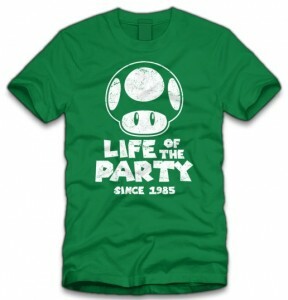 On the front of this t-shirt you will see an image on a mushroom just like the one seen in Super Mario Bros. video game along with the saying “Life Of The Party Since 1985”. This t-shirt is available in a wide selection of sizes that range from Small to 3XL and it comes in a choice of 3 colors Kelly Green, Hunter and Cactus. Made from 100% cotton to give you that perfect durable and comfortable lasting you a long time. Get a closer look at the Super Mario Mushroom Life Of The Party T-Shirt. There is always time for a party and this black women’s t-shirt is just perfect for starting one. 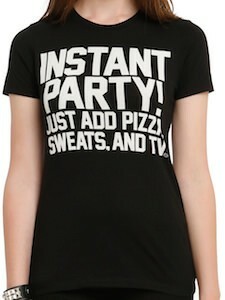 On this black t-shirt it says “Instant Party! just add pizza, seats, and TV”. So if you are the kind of girl that likes to relax in front of the TV eating pizza and being comfortable then this party t-shirt is just perfect for you. And you can get this party t-shirt in junior sizes XSmall – 3XL and if you go a size up it will be even more comfortable with those sweatpants. And yes the instant party t-shirt is made from 100% cotton for perfect comfort. Come take a closer look at this Women’s Instant Party T-Shirt. This t-shirt is fun and will make people smile and it is like wearing a party that never ends. 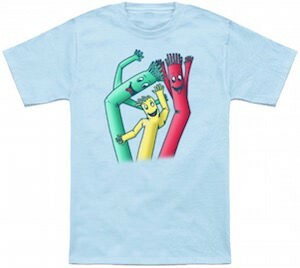 On this t-shirt you can find 3 of those inflatable tube men that you see outside once in a while and rain or shine they always seem cheerful and having a blast. If you want to have fun and party all day long then wearing this t-shirt could be the perfect start. And yes of course this t-shirt comes in many colors and is available for kids, men and women so almost all sizes will be covered to. So lets get that party started by wearing this Always Partying Inflatable Men T-Shirt. Who is ready and DTF? Wait what do you mean I think, clearly I am talking about a fiesta, Down To Fiesta! This is a t-shirt that features in large block letters “DTF” with a little mexican sombrero on the “D” aswell as the saying and meaning of DTF “Down To Fiesta”. Made from 100% cotton to give you the perfect shirt that will be both durable and comfortable, this funny DTF t-shirt is available in a wide selection of sizes that range from Small to 3XL and have a look at the different styles you can get this print on. 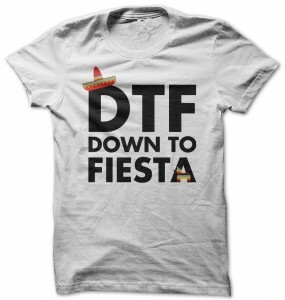 Have a party with the DTF Down To Fiesta T-Shirt. Sometimes you wonder what a person is thinking about. 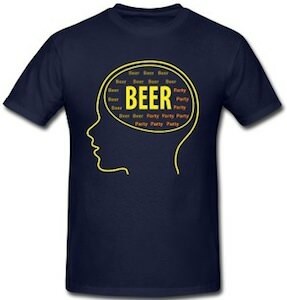 The person on this t-shirt is thinking about one main thing and that is BEER. On the shirt you can see a human head and a thought bubble inside it and in that bubble there are two words floating around “party” and “beer” and beer is definitely winning but I guess a party would help finding more beer. This human beer t-shirt comes in a range of colors and is available in sizes Small – 2XL. Come take a closer look at this All I Think About Is Beer T-Shirt. So you finally did it you graduated and now of course you need to tell the world and there is no better way to do this then wearing a t-shirt that says it all. On this t-shirt you can see the famous mortarboard hat and a diploma and a party waiting to start and below all that it says “Class of 2013”. 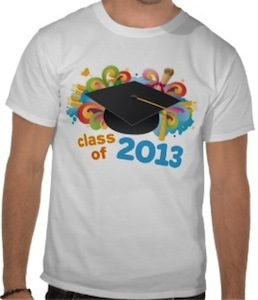 And this fun graduation t-shirt comes in a wide range of colors, sizes and styles for kids and adults, male and female. 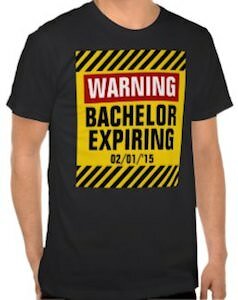 Even if you didn’t graduate but you have a friend that did then you can surprise them with this Graduation Class of 2013 T-Shirt. PARTY AT MY CRIB!!!! Literally. 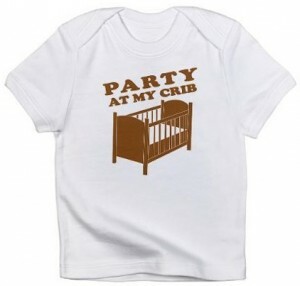 This is a fun and silly t-shirt that features the saying “PARTY AT MY CRIB” on the front with a picture of a baby’s crib underneath….very clever. You can get this Party at my crib t-shirt in a very wide variety of sizes colors and check out the different styles, from infant onesies and infant t-shirts to toddlers and kids styles.